Will an Elliptical Work in a Basement or Other Low Ceiling Room? Hi Fred – Thanks for all the great information on the Elliptical Trainer reviews website! I do have a question which I’m having trouble finding answers to however… I’m 6’1” tall and have a low ceiling height of only 7’. Our ProForm Elliptical finally died after 10+ years of solid use. That had a very low step up height of about 6” or so. It worked well in this space but I am having trouble finding a suitable replacement. All of the newer ellipticals seem to have much higher step up height of 8″ to 10” or more, making it a tight squeeze. Do you have step-up height information anywhere for consumer ellipticals in the $1K – $2K range?? Thanks so much for any guidance you could offer!! When you climb up onto an elliptical and start your workout, remember to take ceiling height into consideration. Both the height of the machine at its highest incline setting and bounce caused by your motion are going to take your head higher off the ground…and possibly too close to the ceiling. This can cause big problems if you are in a low-ceiling room (like a basement) and happen to be a tall person. One way to determine what machines will work is to look at the step-up height. This is the minimum amount of added height that will be necessary in order to avoid head trauma on the ceiling. For instance, NordicTrack machines typically have a step up height of around 14″. This means a person who is 6-foot tall needs a minimum of a 7’4″ ceiling. The incline settings of the machine are also going to play a bit of a role on how high you’re boosted off the ground. Horizon is another brand that advertises lower step up heights, so they are worth checking out. Of course, the one way to verify the height is to physically get on a machine, measure the height of the pedal at the top of the elliptical stride, add your height and allow a few inches for bounce. If you are considering a particular type of machine, definitely verify this pedal height before finalizing your purchase. 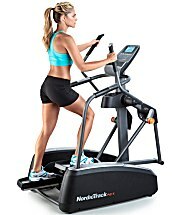 As for price range you mentioned, we recommend you check out our latest Best Buy Ellipticals in the Mid-Range Elliptical ($1,000-$1,499) and Quality Elliptical ($1,500-$1,999) categories.